Followers of Baylor football have seen the legend of RG3 reach incomprehensible heights this season. He makes split-second decisions with ease, passes with uncanny precision, and if everyone is covered, Robert has another not-so-secret weapon: world-class speed. He's even been known to punt, catch passes and throw blocks on occasion. National media members have raved about him, especially after he led the Bears to victories over TCU and Oklahoma in front of national audiences. It would be plenty impressive if that's all there was to say about Robert Lee Griffin III. But Robert is and does so much more. He is the model student-athlete, a great example of what's right about collegiate athletics. His likeability factor is through the roof. ESPN pundits have called him "The Most Interesting Man in College Football." He is an obedient son, an invaluable ambassador and pillar of the Baylor community, a Central Texas icon, all at the ripe old age of 21. Oh, and he just won the Heisman Trophy. Yet, there's even more. Robert is a young man of character, true integrity: selfless and humble. What may be most impressive about RG3, simply put, is his prowess at doing the right thing on the field, off the field, in the classroom, in the community, or while being interviewed in front of millions during a live national television broadcast. Above all, he is driven by a higher calling. The only son and youngest of three children, Robert was born in Japan to Robert and Jacqueline Griffin, both Army officers at the time. The New Orleans natives moved from Japan when Robert was two, living in Washington, Louisiana and Alabama before settling in Copperas Cove (about 75 miles southwest of Waco) by the time Robert was in first grade. Born into a military family, the younger Robert says he was heavily influenced by his parents to learn discipline. But his relationship with God, he says, was his most important influence. "I've been in the church since I was 7," says Robert. "My parents didn't push it on us but they made sure we grew up in the church, so that's all we know, that's what we do." He didn't play organized football until age 11; his first love was basketball, and he wanted to "be like Mike, like all the other kids." At home, Robert's parents describe him as a quiet, serious, very frugal young man. They tell stories of having to check his side of the house because it was too quiet. Of shopping trips where Robert's sisters filled their carts to spend all the money they had earned, while Robert surveyed his options before deciding to save his money for something he really wanted. The Griffins offered their children rewards in the form of toys for good grades. Their son had a particular fondness for Teenage Mutant Ninja Turtles, Batman and Power Rangers -- enough so that Robert's dad intentionally introduced his son to Bruce Lee, "because they didn't make toys for that." When it came time for Robert to decide where to attend college, the Griffins sent him to Stanford on one unofficial visit with a few hundred dollars, urging him to enjoy himself on the visit. "On his way back, he called me and said he was hungry," remembers the elder Griffin. "I said 'Okay, have you spent all that I gave you?' And he said, 'No.' I said, 'What's the problem?' He said, 'Well this airport food is really expensive.' You know, it's like a dollar or two more. And he didn't buy anything." Young Robert's character was particularly tested just as he entered his teen years, when he learned his father was unexpectedly heading back to Iraq. "Our family was all geared up for his retirement," says Jacqueline, "and Robert was excited, because 'Dad's gonna retire, he's gonna always be around,' for practice, stuff like that. One day, my husband came home and said, 'I have to go to Iraq; they cancelled my orders.'" The Griffins conveyed to Robert the news -- on their son's 13th birthday. "My husband said, 'Son, I've got to go do this,'" Jacqueline remembers. "'I'm not gonna be over there long; I'll be back and everything will be back in place like it's supposed to be, retiring and everything. But this is what I need you to do. I need you to make sure you'll be the man of this house until I come back. Take care of your mom and your sisters, and keep doing what I taught you to do.'" Robert was upset, but he took his father's words to heart, pushing himself harder in football practice, basketball practice, and at his schoolwork. Jacqueline says he was vigilant about not allowing his mother or sisters to read or watch news reports about the war. "Being a mom and a wife, I'm concerned about my husband, even though I had my faith and I trust God," she recalls. But Robert would remind the family, "'Dad said not to watch that.' He was going by the letter of everything his dad told him, which really was good for me because I knew I didn't have to worry. "When I saw that, I knew that this kid is driven, that Robert has an anointing on him and he's gonna do what we ask of him." In Copperas Cove, Robert's high school years were often brilliant, though at times, challenging. Some in the community questioned if Robert was the best choice to be the team's starting quarterback. Robert continued playing basketball, and that led some to wonder if he was committed enough to the football program. Doubters or not, Robert made believers of them by leading Copperas Cove to the 4A Division 1 State Championship game in 2006 and 2007. A state record holder in the 110 and 300 hurdles, Robert was one of the best athletes in the nation -- his 35.33 time in the 300 was just one-hundredth of a second behind the national high school record. As always, the Griffins continued to dedicate themselves to their children. Jacqueline has attended hundreds of Robert's various practices through the years, and Robert Jr. has worked to teach his son the finer points of sports from the track to the gridiron. (At Baylor, the Griffins have attended every football contest, even helping to start a tailgate tradition that connects football players' parents to each other and to Baylor.) The elder Griffin's efforts helped Robert become a national hurdle champion and one of the finest quarterbacks in the country. For instance... There are times when an errant snap gets by Robert, which is a moment of panic for most quarterbacks. Not so for Robert. Sometimes Baylor ends those plays with a first down or even a touchdown, but rarely with lost yardage. Such efforts bring fans to their feet, but Robert's dad is never surprised, because he has spent countless hours with his son making contingency plans for when the unexpected happens. "The crowd will be fired up, but I don't get excited because I trained him doing that," says Robert's father, noting that his son probably watches more film than some coaches do to make sure that nothing sneaks up on him. "I would throw the ball over his head and make him work on instinct. Don't go for the first bounce; let the ball take a direction, and then you go after it when it's not moving so fast. We worked a lot of things that go wrong. The coaches have great plans, but things don't always go as planned. So let's work on those other things, too, you know?" During the recruiting process, Robert considered several schools, including Stanford, Tennessee and Houston his father says. Many prominent programs coveted him for his speed, with some asking him to move to safety or delay pursuing his dream of running in the Olympics. However, Robert and his father were adamant RG3's best position was quarterback. Griffin made an unofficial visit to Tennessee and found Coach Phil Fulmer's presentation appealing. Yet he was hesitant to commit: Robert told his father that he felt that Coach Fulmer's appointed replacement, then-offensive coordinator David Cutcliffe, would not be there the following year. Robert was right; Cutcliffe instead took a job a Duke. In November 2007, Robert took an official visit to Stanford. Then-Stanford coach Jim Harbaugh (now leading the San Francisco 49ers) was coming hard after Griffin to play quarterback. "Coach Harbaugh was really recruiting Robert heavily, because he was going to be Harbaugh's first recruit," says Griffin's father. "Andrew Luck wasn't recruited by Harbaugh, but by [Harbaugh's predecessor] Walt Harris." Robert saw eight quarterbacks on the Stanford roster and felt his chances at playing soon weren't strong. He also realized how far he would be from his family and decided to rule it out. He would have arrived on campus before Luck (who also was a Heisman finalist). The Griffins took an unofficial visit to the University of Houston and met with Art Briles. To say that visit was the beginning of something beautiful is an understatement for Baylor fans. "When we went to Houston there was just something about Coach Briles," says Jacqueline. "He's such a people person, and Robert connected with him. When [Briles] found out we were coming, he set up the room for Robert to watch film with him; they sat down and he went over the playbook with Robert and explained some things. He treated Robert like he was already on the team. Robert just really liked the connection that he and Coach Briles had, and so did we. It meant a lot to us that he would even take the time to sit down with Robert like that." When Briles moved to Baylor, Robert followed. Enrolling in January 2008, the 17-year-old quarterback immediately had a strong spring, emerging as stiff competition for incumbent Blake Szymanski, a junior, and Miami transfer Kirby Freeman, a senior. By the second game of 2008, Robert was Baylor's starting quarterback. The rest, as they say, is history. "God does everything for a reason, so I ended up here at Baylor for a reason," Robert says. "I'm glad it happened. Right now, I could be at the University of Houston, with or without Coach Briles. But He happened to let Coach Briles take the Baylor job early so I could come to Baylor." When things work out so well, not only for Griffin, Briles, Baylor football and the university, it's easy to see why Robert points to the heavens after each touchdown. Somehow, Robert always seems to keep things in perspective. "Being a football player here, it's humbling, especially when you come in to what Coach Briles and I did, and where the football program was at the time," he says. "To see how it has changed, to everybody being happy and excited about what we're doing, it just makes you appreciate the times you can do something for people, because that's all we're doing really as football players. Yes, we're getting our names out there and we're doing great things for ourselves, but we're really doing it for everybody here at Baylor, because especially in Texas, football is king. Football teams on fire make a lot of people happy." Faster than everyone on the field, he's also faster than anyone in completing his coursework. Robert graduated high school in just three and a half years (and still ranked seventh in his class at Copperas Cove High, a 4A school). He completed his political science degree at Baylor in three years, graduating in December 2010, and will complete his master's degree in communications studies in May after just a year and a half. In order to graduate high school early, Robert took extra classes before his senior year so he could pursue his goal of representing the U.S. in the 2008 Summer Olympics. Robert began his Baylor career in January, both training for the Olympics and posturing for the starting quarterback position. When he fell one spot short of reaching the finals at the Olympic trials that summer, he was barely 18. At Baylor, he took four straight 16-hour semesters and attended summer school, putting him ahead of the curve once more. Realizing he was getting close to having enough hours to graduate, Robert decided to press ahead. Advisors granted him a waiver to take two extra classes in the summer of 2010. He took 15 hours the following fall, finished in three years and graduated on the same day as his father, who completed a master's in psychology from Texas A&amp;M, Central Texas, but attended his son's ceremony instead of his own. "The way I looked at it was that not everybody gets an opportunity to say they graduated in three years from college," says Robert. "I said, if I have an opportunity to do it, why not go for it, especially if it's not gonna break my back? It was something that came up and I was like, 'You know, I'll go for it.' I went for it, and I got it." Robert realizes both the cost and the value of a Baylor education. He knows he's helping his parents by fully utilizing his scholarship, absorbing a mountain of knowledge and racking up multiple degrees in the process. Still, speed is nothing without substance. John Cunningham, senior lecturer in communication studies, says it has been a privilege to have Robert in two of his courses. "Robert is the type of student that truly makes me feel blessed in my job," says Cunningham.&nbsp;"I wish I could clone him and have 25 Roberts in every class. As good as he is on the field, Robert may even be a better student." Cunningham notes that Robert demonstrated a lot of the same qualities in the classroom that he shows on the field. He worked extremely hard, was always prepared and always offered insightful contributions during class discussion. When you think about all that student-athletes are responsible for, it's easy to give them a pass when it comes to making time for community service. 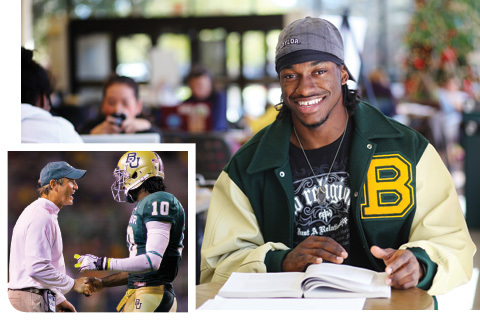 But at Baylor, many student-athletes choose to volunteer in the community, and Baylor's star quarterback is among them. In fact, Robert has contributed countless hours in supporting service organizations in the Waco area. As a volunteer with Friends for Life, he spends time with seniors and adults with disabilities who are part of the organization's daycare program. And with Special Olympics, he has served as a volunteer coach for athletes. Additionally, Robert has spent time supporting the One Book, One Waco reading program for local elementary school children. He also speaks regularly to middle school and high school students about the importance of a solid education and sportsmanship. "I think what I do the most is mentoring kids, and a lot of times it is people coming to me and asking me to talk," says Robert. "I'm not one to turn a lot of people down, I sign a lot of autographs and do other things. You enjoy it while you can. "But I think the most humbling experience I've had, the thing that opens my eyes the most, is when I volunteer at Friends for Life. We visit about life experiences and things like that, and they make sure you appreciate life. It makes you want to come back and spend more time with them." It was not exactly love at first sight when Rebecca Liddicoat, BS '10, met Robert in March 2009. A mutual friend arranged for them to meet. "When I first met him, I thought he was a little weird," admits Liddicoat, a native of Boulder, Colo. who majored in biology and was president of CHI's Service Club. "I was a little nervous, and I asked him why he was wearing girls socks. He had on those weird socks he always wears," referring to the colorful apparel Robert often dons, featuring the likenesses of characters like Cookie Monster, SpongeBob SquarePants and Scooby-Doo. "I was just getting out of a real bad relationship," Robert remembers. "I really wasn't looking to get into another one, but she rubbed me the right way. There's just something about Becca; she's all for me, and sometimes you need people in your life like that." Liddicoat says Griffin was humble and funny, and the two soon began dating. Fast forward to just after the weather delayed Baylor's Homecoming 2010 victory over Kansas State, which clinched Baylor's bowl eligibility. Griffin decided the night was ripe for a grand finale. "After the game, all of our parents were there, but they had already left us before we left the stadium," says Rebecca. "Robert was acting kind of strange, driving slow. He was stalling and coming up with things to do, and he said we have to go to the indoor facility. I wasn't really expecting it. When we got there it was all dark, and then I realized something was happening." Liddicoat says she and Robert have a special place on campus and she had always expected he would propose there, but the rain made the spot less appealing that night. As usual, Robert was prepared. He audibled to the Allison Indoor Practice Facility. Inside the candlelit building, Robert retrieved the ring from his father, then crooned a ballad he had penned for the occasion, accompanied by a teammate with a guitar. Surrounded by their families, he took a knee and popped the question. "It was really a happy moment. I was just all smiles," Liddicoat recalls. No date has yet been set for the wedding; Rebecca says the couple is waiting to see where Robert will be next year before firm plans are made. Robert has something else going for him: a genuine personality that people connect with instantly. And it's safe to say no Baylor student has ever been in front of the camera or answered as many questions as Robert. He's such a good ambassador for Baylor because he is able to understand his own Baylor experience and put it in context with the bigger picture. "Coming here has been great," says Robert, his eyes glowing with sincerity. "Coach Briles has been a man of his word, not that he promised me anything but an opportunity. I made the most of it. School has been great, the fans have been hungry, and the atmosphere here is amazing." Robert calls himself a natural loner, but he says he considers many of his teammates "like brothers," including fullback Erik Wolfe and tailback Isaac Williams. "Some of the guys like Jared Salubi and Lanear Sampson, we're all close because we came in together and we've experienced everything, when this building [the Simpson Center] wasn't here, all the workouts and Coach Kaz [Kazadi, the strength and conditioning coach], when he first got here, and how evil he was," he smiles. "Overall, my time here has been great. I've grown as a person. All the classes that I've had, talking about different theories and things like that which you don't get to really do in high school - and especially being in grad school, where it's mostly me talking to the teacher -- you really get to figure out a lot about yourself, what you really think and believe, and how you adapt to everything. So Baylor really has been a great experience for me." 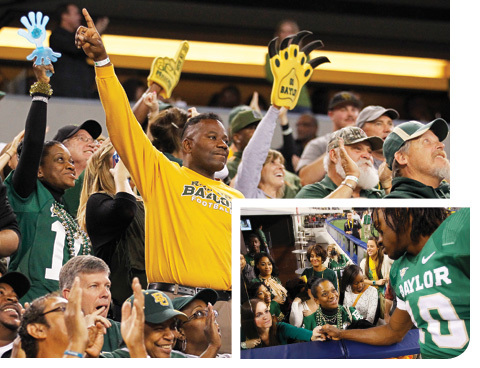 As for his parents, the Griffins have been just as pleased with their Baylor experience. They are happy with Baylor's Christian environment, its commitment to students, and even with how the Waco community has fully embraced "a rival Copperas Cove kid," whether Robert is shopping at Walmart or speaking in local schools. They say Baylor is a university parents should want their kids to attend. "Robert's doing really well; he's growing a lot," says his father. "From our perspective, based on the type of kid Robert is, Baylor has some tremendous mentors here, some great models as educators.There's such a commitment level from Baylor that these kids can learn, thrive, go out into the world and do some great things. Academically, they are not letting kids slip through the cracks. "I feel that Baylor taking to Robert is almost like - it was ordained, it was God's will for it to happen," he continues. "Because, trust me, I had some ideas [about Robert going to other places], and he wasn't happy about them, but when Coach Briles announced that he was coming to Baylor, Robert was very happy about that. So I think together it was a great development. Robert had the chance to experience other options out there. Robert really likes this university - not just football, but Baylor as a whole." Before each game, after each spectacular score, the eyes and cameras gravitate toward Robert. Giving thanks to God, he kneels, prays and points to the heavens. Often, he salutes scoring teammates, a nod of respect toward his parents' military service. Clear to all, Robert knows he's got a lot for which to be thankful. As much attention as he gets, Robert fights off the temptation to make things all about him. After attracting the spotlight, Robert shines it on God, his family, Baylor, his teammates and coaches. His humility is authentic. "Whenever you can be a Christian and come to a Christian university like Baylor and make a difference like this whole football team has, it's great," Robert says. "He gives you the stage to make a difference and not to just talk about yourself, but lift Him up. There are a lot of different types of Christians everywhere, but my biggest thing is it's not our job to judge; it's just our job to go out, praise Him, let people know what He's doing, and let people follow if they want to. "So I praise God, I thank him for everything. Purposefully, you live every day for Him, and when He gives you the opportunity to speak up for Him or to do something in His name, you do it." Though Robert could return for one more year at Baylor, some prognosticators are projecting him as a first-round NFL pick should he decide to forego his last year of eligibility -- an enticing prospect for anyone. But Robert isn't just anyone. "Everybody wants to make a difference in life, so that's what I want to do," he says. " I want to take my degrees and go to law school -- find a way to make a difference, not just be another lawyer or another football player." "Robert clearly understands that if he stays or if he goes, mom and dad don't need him to go because we're not financially hurting," says Jacqueline. "It's all about what God tells you to do, and if it's the right time for you in your mind, if you stay you stay, if you go you go, but it does not weigh on us." Robert already has received an NCAA waiver for a medical redshirt following his season-ending knee injury during the third game of 2009. But he also must receive a waiver to enroll in Baylor Law School, his desired program. Robert's case, of course, is a special one, as many student-athletes never finish one degree, much less complete two and start on a third. After Robert's freshman season, his father says many people were talking about how Robert was too good for Baylor, that he needed to transfer. "Robert was like, 'What is their problem? I'm not leaving Baylor. This is a mission, this is a challenge,'" says the elder Griffin. "After Baylor beat Kansas State to become bowl-eligible in 2010, Robert said, 'People will forget all the names of the players on this team, but they won't forget the 2010 team because of the bowl drought.' I said, 'Son, those are powerful words.' People felt that, and he was right. People may not remember who the players were, but they will remember that team, that year." Both father and son have been right about so many things, but no one who has ever seen Robert play is going to forget him. Baylor folks won't forget how one young man has so proudly represented Baylor University and its mission on and off the field, how he's carried himself with both confidence and humility, and how he so consistently prioritized God, family, team, community and Baylor above himself. Robert Griffin III is a true renaissance man, excellent at seemingly anything he puts his mind to. Whatever the Lord has in store, Robert will be prepared. One day we might see him in the Olympics. He could be leading a team down the field in the Super Bowl. Maybe he'll be a successful news anchor, judge or attorney, or perhaps he'll head up a nonprofit organization. In all likelihood, Robert will become a caring family man and a pillar of whatever community is blessed to have him. Like it or not, Robert's time at Baylor is closer to the end than the beginning. For now, all the Baylor family can do is appreciate this once-in-a-generation phenomenon while he's on campus. He will leave eventually. But he will never be forgotten.